With the Horizon Powercats PC60 (60’9″ LOA, 24’6″ beam), Horizon Powercats focused on designing an exquisite power catamaran with a high-end finish and ample lounging and entertaining options. The PC60’s appealing lines are reminiscent of a stylish motoryacht; from the side, it’s hard to tell that it has two hulls. Powered by Cummins QSM11 705-hp engines, the PC60 runs to a top speed of 23 knots, and at 18 knots, has a cruising range of 420 miles. 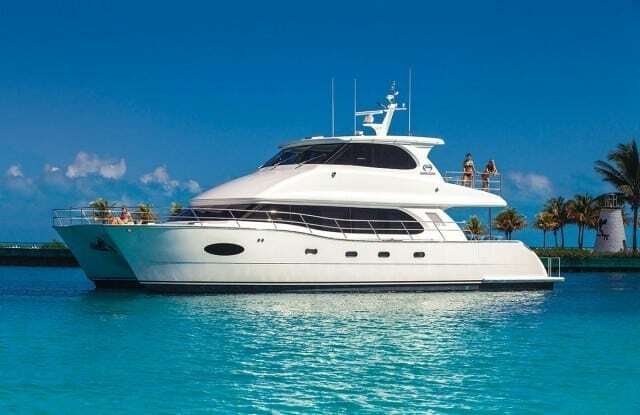 She sleeps six guests in three staterooms with room for two crew in the fourth cabin. The PC60’s helm features a Stidd helm chair, a bench seat to starboard and sun lounge to port. The extensive electronics package includes a full complement of Garmin equipment, Wi-Fi router, and a complete entertainment system. The interior appointments reflect a European style, and the eclectic wood combinations of satin and gloss ribbon cut walnut, light birch flooring, and plush soft furniture surfaces have a sophisticated feel yet remain relaxed and inviting. The galley options include a Sub Zero full-height refrigerator/freezer, wine coolers, dishwasher, oven, and induction cooktop. The PC60 appeals to clients who have owned much larger motoryachts, fishing boats, trawlers, and lower-end power and sailing cats and offers a similar volume, deck space, accommodation, and amenities in less space resulting in half the annual running costs and improved attributes.